A sultry old European cultivar with rounded greenish fruit stippled with maroon and a ghostly bloom, Bourjassotte Grise is adaptable, producing intensely flavorful figs in cool summer areas and hotter climes. Dense red flesh mimics strawberry aspic. Occasional immature fruit drop doesn't seem to affect overall productivity. 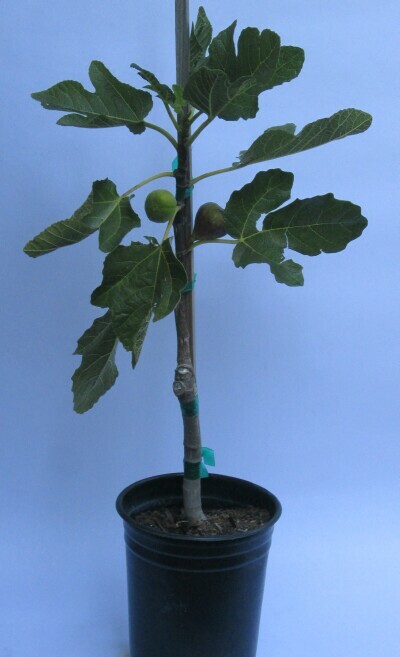 As of February 2019 trees are much smaller than photo, about 6" tall, 3/8" caliper, no branching, well-developed rootball. Grown in 1 gal containers.